Soul Singer Robert Finley Releases New Single “Get It While You Can” – WATCH NEW VIDEO! Soul-singer Robert Finley is the most added artist on radio’s AAA format this week, with his song “Get It While You Can” off his recent album Goin’ Platinum!, per two sources: FMQB and Neilsen BDS’s indicator & combined station panels. Adds include Music Choice, WFUV (New York), WXPN (Philadelphia), WERS (Boston), KCMP The Current (Minneapolis), KTBG (Kansas City) and many others. 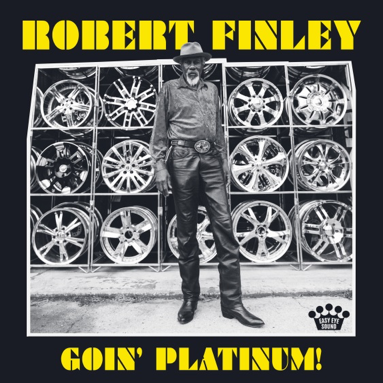 Robert Finley’s second studio album, Goin’ Platinum! is out now via Easy Eye Sound. The album captures a singer at his prime, surrounded by all-time-great session musicians with skill to match his singular voice, including drummer Gene Chrisman (Elvis Presley, Aretha Franklin), keys player Bobby Wood (JJ Cale, Bobby Womack), horns players from Preservation Hall, and legendary guitarist Duane Eddy. Goin’ Platinum! was co-written and produced by The Black Key’s Dan Auerbach and also features writing credits by legendary songwriters John Prine, Nick Lowe, and Pat McLaughlin. “These guys are legends in their own time,” Finley says. “I’m grateful to be part of the team and working with such extraordinary guys. We hooked up the soul and rock and roll and made one hell of a record.” Goin’ Platinum! is available for order on CD, vinyl, and digitally here. Recently, Finley also announced the 20-date “Easy Eye Sound Revue Tour,” with Dan Auerbach and special guests Shannon & the Clams. The extensive North American tour will kick off on February 10 in Vancouver with stops in Brooklyn, Portland, Austin, Seattle, Los Angeles, Nashville and more (full dates below). Each night will feature performances by Easy Eye Sound artists including Dan Auerbach, and of course, Robert Finley, all backed by The Easy Eye Sound house band, composed of Gene “Bubba” Chrisman, Bobby Wood (keys), Russ Pahl (guitar), and Dave Roe (bass). Tickets for this tour are on sale now and can be purchased here. Robert Finley, a self-taught musician, is no stranger to collaborating with and leading an elite group of musicians. Finley joined the army as a teenager to become a helicopter technician, but quickly found work as the leader of the Army’s band and toured the continent many times with them on guitar and vocals. Following his military service, Finley settled back in the States and made a living as a carpenter, still playing music, but more as a hobby than professionally. It wasn’t until Finley lost most of his eyesight and was forced to retire from carpentry that two happenstances rejuvenated his career. First, while playing to a street crowd in Arkansas, Finley met a member of the Music Maker Relief Foundation, an organization that provides direct support to older and underprivileged musicians. This lead to his first LP, Age Don’t Mean a Thing, which was released on Big Legal Mess Records in the fall of 2016. A video of Finley performing songs on the street also made its way to Dan Auerbach, front man of The Black Keys and new Nashville-based record label owner. Auerbach immediately recognized the singer’s immense and innate talent, and writing and recording sessions with the Easy Eye Sound house band, which Relix Magazine named “Nashville’s New Wrecking Crew,” spawned the songs on Goin’ Platinum!